Dr. N. Subramanian, is a Civil / structural consultant (currently based at Maryland, USA) with over 30 years of experience in Industry (including consultancy, research and teaching); former CEO of Computer Design Consultants, India, and Director of Computer Technological Institute, author of 200 technical papers and 25 books, is an asset for the field of structural engineering. Dr. Subramanian, born at Srivilliputhur, Tamilnadu, and brought up in Chennai, did his initial schooling in Chennai. Later he joined Thiagarajar college of Engineering, Madurai for perusing his graduation in Civil Engineering. After graduation, he soon completed his Post Graduation in Structural Engineering from College of Engineering, Guindy, Chennai and then joined IIT-Madras (now Chennai), for doctoral degree. He did his Ph.D. under the guidance of Professor Prof. C. Ganapathy and topic for the research was “Analysis and behavior of steel frame folded plate roofs”. Then he was with IITM, as Post-doctoral Fellow & Project Associate for about two years. He also worked with Technical University of Berlin (with Prof. J. Lindner) and the Technical University of Bundeswehr, Munich (with Prof. Ch. Petersen) for two years as an Alexander von Humboldt Fellow. After completing academic studies, Dr. Subramanian engaged himself in actual practice. After working for a brief period with College of Engineering, Guindy as Asst. Professor, he started his own consultancy in the year 1982. Consultant to several organizations like TANSI, Indian Telephone Industries Ltd, GTL Limited, Tamilnadu Housing Board, Hutch Limited, Tube Investment in India, E.C.C (I) Ltd. , Airtel Limited, Thapar waterbase Ltd. , T & B International Ltd., Riyadh; and AB Wibe , Sweden, his organization has executed the design of more than 650 projects, including several multi-storey concrete/steel buildings, Communication and microwave towers (designed more than 500 towers ranging in height from 20m to 120m), Pile and Tower foundations, Space frames, Sugar plant and aqua culture plants, Industrial structures (using hot rolled and cold rolled steel sections), schools, hotels, hospitals and some special structures. Dr. Subramanian also developed 18 special purpose software packages for the analysis and design of structures using FORTRAN and C, and used by more than 120 organizations in India. He was holding a CEO position for Computer Design Consultants, <?xml:namespace prefix = st1 ns = "urn:schemas-microsoft-com:office:smarttags" /><st1:country-region w:st="on"><st1:place w:st="on">India</st1:place></st1:country-region>. During the long journey of 30 years, he invested his valuable time in making next generation of civil / structural engineers, contributing to technical forums and also in research works. Based his excellent work he also received several awards including the Tamil Nadu Scientist Award, and the ACCE – Nagadi award for best publication for his book, Principles of Space Structures. He is registered as Professional Engineer, Institution of Engineers, India, and Registered Valuer of Income Tax Dept., Govt. of India. Dr. Subramanian, wrote and published more than 200 Technical papers in national and International Journals, on various aspects of Civil / Structural engineering including behaviors of concrete and steel structures. *Restoration of a Cold Storage Factory Building, Journal of Performance of Constructed Facilities, ASCE. In addition to various papers, Dr. Subramanian has composed 25 books, amongst them are the two books on Steel Structures (limit state method) published by Oxford University Press, New Delhi and another on Space Structures (First two editions published by Wheeler publishing & the latest one by Multi-Science, U.K.) are very popular amongst the fraternity. The other books are on programming and computers. He also published a book on Jokes! Dr. N. Subramanian in a Life Fellow/Member of various national and international institutions, including ASCE, ACI, ICI, ACCE (India), IEI (India), and Computer Society of India. He delivered lectures in many seminars and courses. He served/serving as Editorial/Review committee of the following: Bulletin/Journal of the Indian Concrete Institute, CE &CR, Int. Journal of Space Structures, U.K.; Indian Concrete Journal Applied Mechanics Reviews, U.S.A. & American Concrete Institute. He has Served as Vice President of the Indian Concrete Institute and Association of Consulting Civil Engineers (<st1:country-region w:st="on"><st1:place w:st="on">India</st1:place></st1:country-region>). He also acted as external examiner for M.E., M.S., & Ph.D. Thesis. He organized several seminars/conferences and edited their proceedings. He also was an Organizing Committee member of several seminars/workshops. He has also reviewed several books for journals and wrote articles in Newspapers. Dr. Subramanian has instituted an Award through the Association of Consulting Civil Engineers, for best software in Civil Engg. He also was also an active Rotarian and served his club in various capacities, including the post of President. Dr. Subramanian is an active and sponsor member of Structural Engineering forum of India. He keeps motivating and sharing his experience with the growing structural engineers on the forum. We are thankful to Dr. Subramanian for his contribution to the field and also wish him all the best for his future endeavors. Many times we have seen this topic been discussed "Gems of structural Engineering"..
in which we have seen lot of gems of structural engineering..but we forget our own gem of the forum,ie, Dr N Subramaniam.I thank Vivekji for this post. Dr Subramaniam is a good academic person , Practical engineer and above all a very good human being. Actually I was also working on same subject..But vivekji posted before me..
Resp. Dr. Subramanian Narayanan's Brief engineering biography First published in The Indian Concrete Journal, May 2012, Vol. 86, No. 5, pp. 37-38.
distinguish him from other Gems. last 8-9 years here on sefi - - - a mega contribution to fraternity. I hasten to state that your contribution on a daily basis, with more tinge towards practical aspects, is in no way inferior to my contribution. I always used to wonder how you are finding time to answer so many questions, considering the fact that you do not have internet facility at home. May God Bless you and another Gem of SEFI Er Rangarajan! I take this opportunity to thank Er Vivek for posting my profile here and Er. S.Adhikari for his kind words. 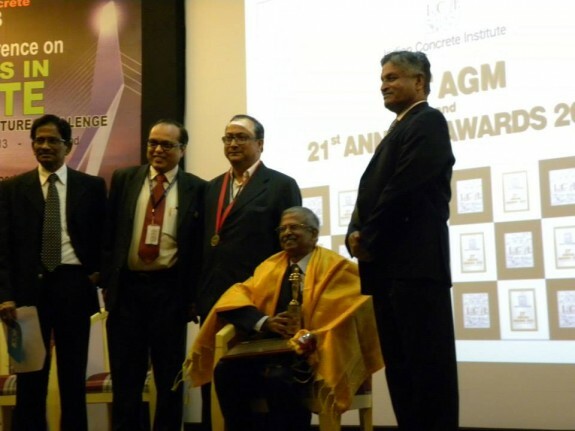 I am happy to share here that Dr. N. Subramanian ji, has received the ICI - L & T Award for Life Time Achievement 2013, for his contributions to the field of 'Design of Concrete Structures', during the AGM and Award function conducted during the ICI-IWC 2013- International Conference on Innovations in Concrete for meeting Infrastructure Challenge, held at Hitex Exhibition Centre/NAC, Izzat Nagar Hyderabad 500 084, on Oct. 25, 2013. 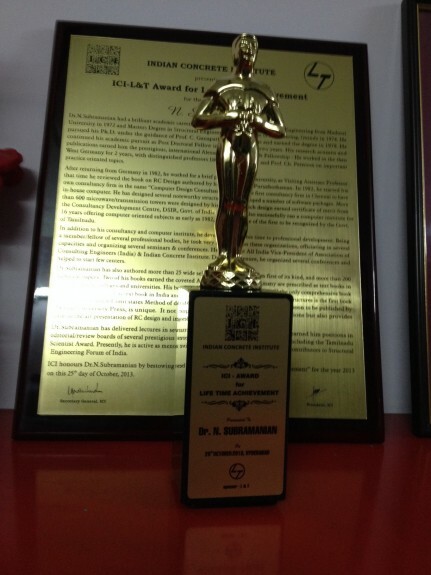 Let's join together to congratulate Dr. N. Subramanian sir on this achievement . 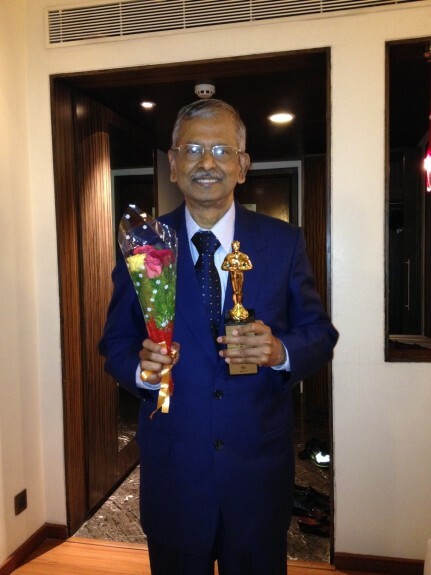 . .
Posted: Wed Nov 06, 2013 12:40 pm Post subject: Many thanks for posting achievements of Dr. N. Subramanian. I add my thanks to you for posting details about achievements of Dr. Subramanian in the field of Structural Engineering . In a way I am also his student (who is not among 14000 Sefian's?) because I use his Steel Design book " Design Of Steel Structures " . Many thanks for your kind words. May God Bless You!